Yes, the James Bond rumours are still raging like wildfire, but here’s some concrete Big Driis news for you to sink your teeth into. Hollywood megastar, DJ and Hackney local Idris Elba is opening a brand-new bar in London. The Parrot is a cocktail bar and live music venue in the Waldorf Hilton hotel in central London. The bar is slated to launch in October and will have its own house band performing nightly. Cocktails at the 60-seater hotel bar with a tropical theme are said to be inspired by the eponymous jungle bird, with 15 in total for guests to get acquainted with. 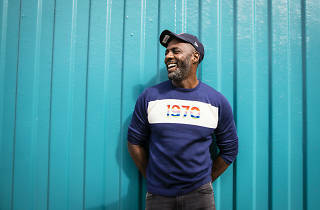 Idris Elba’s fame has clearly had an impact on the concept, too, with The Parrot promising to bring secret A-List gigs to the capital, as well as having its own chauffeur-driven limo to help VIPs enter in style. Very Bond. The Parrot is set to open in October at the Waldorf Hilton, Aldwych, WC2B 4DD. Find more starry spots in our list of London’s best bars. Get boozy news sloshed straight into your inbox when you sign up to Time Out.